Farmingdale, NY – GustBuster®, the #1 Umbrella In Golf, announced today that the following sales reps have been welcomed to the GustBuster sales team in order to better service their national customer base. GustBuster’s patented wind-release vents and flow-through design can withstand winds of more than 55 M.P.H. making it the ultimate wind umbrella. It’s the only UN-Flippable, UN-Flappable, UN-Leakable umbrella in the world. The joints and ferrule of the GustBuster are constructed of a combination of Ultra High-Density Poly-Carbonate, Carbonized Steel and Aluminum and won’t break or turn inside-out. 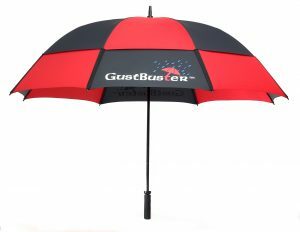 The GustBuster umbrella uses nylon that is a strong 190 thread per inch blend that won’t tear, which is why it’s backed by the manufacturer with a lifetime repair or replacement warranty. GustBuster has revolutionized the way we look at and design umbrellas. It’s the World’s Smartest Umbrella™ because of its superior technology. Media members interested in testing any of the GustBuster products for an editorial review should contact Joe Wieczorek joe@themediagroupinc.com of the Media Group at (847) 956-9090.